Posted on Mon, Nov 14, 2011 : 6:10 p.m. The empty buck pole outside Mill Creek Sport Center awaits its first deer Tuesday with the official opening of deer firearm season. Watch out driving to work Tuesday morning, as it’s opening day of deer firearm season, and once those first shots ring through the air (sometimes as early as a half hour before sunrise) the deer will begin to scatter. “We call this Michigan’s other Black Friday,” said Mary Dettloff, public information officer for the Department of Natural Resources, who added that deer hunters spend an average of $800, and that deer hunting is a $500 million industry for the state. So far this year, about 1.185 million deer licenses have been sold, down about 60,000 from last year, she said. “If opening day is on a Monday or a Tuesday, it’s sluggish, down about 3 to 5 percent,” she said, while if opening day is on Thursday, Friday or Saturday, more licenses are sold. 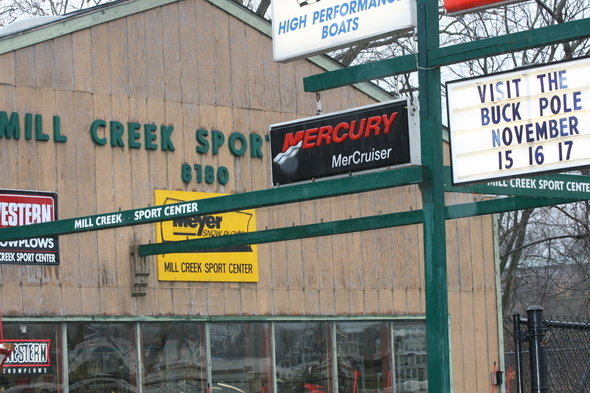 Peter Heydlauff of Chelsea admits he’s not “an avid hunter” but he was in Mill Creek Sport Center Monday afternoon buying ammunition before he heads out Tuesday on family-owned land south of Chelsea for opening day. Heydlauff said he planned to take the day off and hope for the best. He said once he hears shots, the deer begin to run and that’s when it gets interesting. This year he has both a doe and a buck license. He has been enjoying deer hunting season for about 15 years. “Deer season has an economic impact on Michigan and helps control the deer population,” Dettloff said. Dan Schmidt of Dexter also dropped by Mill Creek Sporting Center to for some last minute ammo. “I hunt in a secret spot,” he said, enjoying most of his deer hunting success with his bow and arrow. Schmidt said he’s gotten about 40 deer during the last 25 years. Mitch Granet of Dexter said he’s a small game hunter who recently tried his hand at deer hunting. “I’ve never shot a deer,” he said, adding that there are far fewer deer out there than there are squirrels or other small game. And, it’s not just adults who shoot deer. Carole Marshall, a clerk at Mill Creek, said her grandson, Jacob Marshall, 14, of Lyndon Township went out on a youth deer hunt in September and shot his first deer. She expects that he’ll go out on opening day -- but not until after school is out. Joe Weber of J.C. Deer Processing of Dexter Township said he processed about 50 deer last year and is expecting about the same amount this year. He said a 120-pound deer has about 60 pounds of meat, once he takes the hide, feet and head off. "They're larger in Southeast Michigan than up north," Marshall said. "They're well-fed around here." Sales of hunting equipment have been brisk leading up to opening day, Marshall said and although it was a bit slow Monday afternoon because of the rain, she expected more customers tonight when people got off from work. The sporting goods store is the site of the annual buck pole each year and sometimes there may be a buck hanging from the structure as early as 9 a.m. on opening day; other times, there might not be one there until after 1 p.m., she said. "There have been as many as 65 and as few as 35 over the years. It depends on the weather. If it’s not chilly, then people don’t want to hang them because they don’t want to lose the meat,” she said. Whether the deer are running also depends on the weather, said Ray Fialkowski of Dexter. If it's raining, he said, they'll hunker down. The former hunter said he was leaving Tuesday on a different kind of hunt. "I'm heading to Soaring Eagle (Casino & Resort) to hunt money." As for the buck pole, hunters must agree to hang their bucks for 24 hours on the pole, and they are entered into a raffle drawing that will be held Friday at 7 p.m. The first ticket pulled gets the first choice of a number of hunting-related items, and it's a random draw. 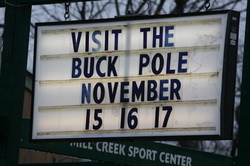 The buck pole will be up Nov. 15-17, and the regular firearm season runs from Nov. 15-30. Wed, Nov 16, 2011 : 11:01 p.m.
To the people that comment on how wrong it is to shoot a deer. The next time your eating your beef do you think about the cattle yard that runs a cow down a ramp then hits it with a baseball bat to die or shooting it in the head with a gun. Or how about when you eat your pork. Hang up a pig still alive by a meat hook and slit it's throat and let it bleed out. Do you feel better eating your beef and pork? Fri, Nov 18, 2011 : 8:38 p.m. Wed, Nov 16, 2011 : 10:56 p.m. I would like to add to. Thanks to the thief that stole our tree stand chained up on our property in Scio (Jackson rd) God hates a thief and you will stand judgement for it unless you repent. Having said that stealing is simply morally and ethically wrong. Fri, Nov 18, 2011 : 8:36 p.m. I thought Christians believed God was not all about hate...but about love. Tue, Nov 15, 2011 : 10:24 p.m. I find the deer carcasses hanging on the pole in Dexter to be repulsive. Hey, hunters...does this make you feel more like a man? Sun, Nov 20, 2011 : 7:28 p.m. Thank you for your kind response. Farm life was hard when I was a child (Dairy farm) but it did make me appreciate what it takes to put food on the table. I agree. It is disrespectful to hang the carcasses of dead animals for public display. I'm holding my own working with horses...but find it to be a bit harder every year. However, there is nothing I would rather do than spend time with my horse, and her buddies. (She is the only mare with three very large Dutch Warmbloods...which makes her very happy!) There is something rewarding about manual labor on farms...I actually find it fulfilling, strangely...There is a beginning and an end to it, and when you come back the next day, the same situation is there...continuity....okay, now I'm rambling. I've been told I can talk the paint off the walls. Have a lovely Sunday. Sun, Nov 20, 2011 : 12:54 a.m.
Ha ha......yes, very much a rambler of thoughts, some say a prime contender to filibuster. Others say a bumbling moron, I'm sure I know what you think. :) I was born n raised on a 1000 acre beef and dairy farm. We had 3 working horses to tend beef cattle in pasture and to fix fence. Then I went to work &quot;in the woods&quot; to pay for my college. Yes, the 1000 hours a year was timbering, the other 1000 or so was in the sawmill. So, yes I very much have a job and i very much have a family. You missed the proverbial trees because of the forest. Growing up on a real farm, we very much relied on the sustenance that the farm produced, one of which was whitetail deer. Back to the original statement you posted, the hilarity of our backmand forth banter is the fact, I totally wholeheartedly agree with your first statement. As a hunter, as a farmer and as a protector of our renewable resources, I never understood or welcomed the flagrant &quot;in your face&quot; displaying of deceased animals. From the buck poles, to them strapped to the hoods of cars with their poor tongues sticking out. I think it's a disgrace to the animals and disrespectful to people like you who have the freedom and right to your independent beliefs. The whole &quot;shock&quot; value is less than appealing. Not at all what you were expecting was it? Take care, keep doing what you do and don't overwork yourself! Sat, Nov 19, 2011 : 11 p.m.
Actually, The entire state of Michigan is horse country. It reminds me very much of upstate New York. I don't quite know how to respond to your post, as you were rambling just a bit. I never said I was a farmer. I said I grew up on a working farm and am no stranger to farm work. I can still throw and stack hay for 3 hours...ride 3 horses for four hours...and muck out stalls...all in the same day. AND I will be turning 61 soon. My horse lives with friends. It is not a typical boarding barn. Having been on the planet for this long, I assure you, I have had plenty of time to see 4 deer, badly injured by bullets. Yes, I know what bullet wound...and shell casings look like. I think a person's motivation is important. I saw two men driving down Dexter-Chelsea Rd. several years ago shoot a deer from their car WHILE it was moving. They hit the deer and drove on. I could see them laughing. That was one of my experiences, as I was the one who got out of my truck, and called my vet. As an equestrian I have spent MANY hours in the woods. Although, I appreciate your thoughtful post, I find it hard to believe that you spend 1000 hours per year in the woods...unless you are unemployed or have no family. Sat, Nov 19, 2011 : 2:22 a.m.
South, would be the reference to southern Michigan. The large abundance to equestrian barns and stables is farbmore predominant in this area, mostly referring to a large amount of city folks that don't have farms but have to pay someone to provide shelter and food for an animal they clearly don't have the means or acreage to take care of in the first place. That does not make you a farmer. If you have come across 4 injured animals in the past 5 years that you know without a doubt were injured by a hunter, I am utterly amazed! I spend over a 1000 hours a year in the woods and in deer habitat and have yet to come across one that was injured by a hunter and in agony. Now, I can't count the numbers I have seen busted up on the side of the road dying in agony from being hit by a motor vehicle. Sorry to he about your father, he was probably around in the DDT days when it was sprayed at will everywhere. As far as hunters poaching on your land, sorry but them are not hunters. They are criminals who happen to be hunting and have to refer back to the automobile analogy used previously. One question you never asked me is if I enjoy seeing the deer hanging by their legs from a pole. You have assumed all this time I am a proponent of it when if you read our diatribe I've never clearly said one way or another. I don't think it's a necessity to question all hunters motives. I think you are right in questioning some though. It begs the question however, what about all the cattle that get shot in the head with a CO2 driven punch? Ouch! Fri, Nov 18, 2011 : 8:35 p.m.
Actually, I grew up on a farm. I know hard work. My father died due to exposure to pesticides over a long period of time. I had chores before school and chores after school. I am not from the &quot;south&quot;. I have no idea where you got that idea, as I grew up in upstate New York. How have I helped white tail deer? I have come across at least 4 in the past five years...all wounded by hunters, and in agony...got help from the DNR...or...once...on a weekend had a friend help me put a still living young doe in the back of my truck and drove it to my horse's vet. The doe survived. No, I do not own a farm. I board my horse at a farm, where I am caretaker when they are out of town. Hunters often poach on the land where my horse lives. Of course, I realize that a few women hunt. But I question the motives of all hunters. Do they hunt for food. Really?...Or are they just in it for the thrill of the kill? Thu, Nov 17, 2011 : 10:57 p.m.
ahhh yes.....the self righteous southern horse person who believes they are on a &quot;farm&quot; because they own a &quot;horse&quot; barn and a few animals. Come talk to me when you are ready to see how the &quot;real&quot; farmers work. We don't have to post that we need to go feed are kittys and &quot;muck&quot; out horse stalls. Feral Cats and Feral Dogs? ummmm. that would be animals that precipitated from domesticated stock that you are now trying to compare to helping wild animals, specifically deer. Your explanantion only slightly detracted from the original question, what have you done for white tail deer? Unfortunately regarding your barn being shot, that doesn't suprise me given the fact that just like automobiles, not everyone should have the ability to have one or use one. In the hands of the wrong person, tragic things like that happen. Glad to know you or anyone for that matter wasn't hurt. also, just so you know women hunters increased 5.4% last year. Thu, Nov 17, 2011 : 7 p.m. I see deer every day on the way to and from my horse's barn. I was also riding in one barn, when a bullet pierced the indoor arena where I, and a few others were riding. Two people got dumped that day. Actually, I am a wildlife activist...and not just on my computer. I trap and have feral cats neutered. I rescue abandoned feral dogs...and a lot more. We may agree to disagree, but do not act like you know anything about me. I must go now, as I have stalls to muck out...horses to feed and water...a barn to clean, 3 dogs to care for...and numerous barn cats to feed. Thu, Nov 17, 2011 : 12:54 p.m. Does it make you feel more like a woman to watch them get blasted into with a vehicle? How about ever watched them starve to death when Michigan gets hit with extreme winters? Other than from the comfort of your house and in front of your computer, have you ever really done anything for wildlife in general? All you see is the net result that you do not agree with. You can't look at the whole picture and realize the day we took over most of their habitat, by default we elected ourselves their managers. Sorry it's just the way it is. Tue, Nov 15, 2011 : 3:48 p.m. Taking the kids to see the Buck Pole! We don't hunt deer, but kids ought to know where food comes from, and seeing the hunt result is always great. Tue, Nov 15, 2011 : 10:25 p.m.
Why don't you let them go out with a hunter and watch a live deer die? Tue, Nov 15, 2011 : 6:31 p.m. It doesn't come from the venison tree? Tue, Nov 15, 2011 : 2:15 p.m.
Well no matter who or how the headline was created it is great. My spouse tells me that the Opening day' supports retailing across the State as the spouses try to match the funds spent by the hunters. Notice no gender ID was used. Tue, Nov 15, 2011 : 12:17 p.m. If you want to ruin a police officers' day, ask him to put down a deer. I did once and the cop told me the paperwork he had to fill out if he discharged his firearm was ridiculous. Tue, Nov 15, 2011 : 4:47 a.m. I do not like the buck pole. :/ Bah. Tue, Nov 15, 2011 : 3:57 a.m. I'm not a hunter, but the more deer killed down here--where the population has increased at a far greater rate than up north--the better. Best of luck to all hunters. Tue, Nov 15, 2011 : 2:54 a.m.
To the trespasser who came onto private property in Pittsfield township on Sunday to apparently &quot;scout&quot; a good spot to hunt. Thank you for stealing my game cameras that you came across on your little excursion. One more reason why I continue to lose faith in my fellow man. Tue, Nov 15, 2011 : 2:37 a.m.
Meat is murder! Tasty, tasty murder. ;-) Re: &quot;The sporting goods store is the sight of the annual buck pole each year...&quot; That would be SITE, not &quot;sight.&quot; Just one of the things Spell Check won't help you with, journalists. ;-) Weather forecast for Washtenaw Cty: 58º and cloudy. Too warm to let a deer carcass hang overnight outdoors. Rest of the week, not much better for that kind of thing. Checked Cadillac's forecast: 50º tomorrow but temps drop into the 30s the rest of the week with the possibility of snow showers. That's where I'd be going to hunt, if I were fortunate enough to go at all. Just mentioning: my own deer harvesting has been all &quot;up north&quot; with the Cadillac / Alpena areas being the farthest south I will hunt. Every single deer I've taken up there has weighed between 130 and 162 pounds. Northern deer are not as &quot;skinny&quot; as some would have us believe. Tue, Nov 15, 2011 : 12:56 a.m. While you not be able to shoot it, the local police or sheriff dept should respond to end its suffering. I've called the humane society before and they have come right out to check the conditions then contacted Michigan state police to put it down. Tue, Nov 15, 2011 : 5:15 a.m.
Tue, Nov 15, 2011 : 12:10 a.m. Please thin them out in my neck of the woods. They are everywhere. Saw one hit tonight was still alive sitting up in the road. It is also illegal to put them down when hit. I was told by the Washtenaw county non police that I could not shoot it to end it agony. Mon, Nov 14, 2011 : 11:52 p.m. Thank Goodness these hunters still can hunt with guns! Tue, Nov 15, 2011 : 2:10 p.m.
NRA president - &quot;Obama himself is no fool. So when he got elected, they concocted a scheme to stay away from the gun issue, lull gun owners to sleep and play us for fools in 2012. Well, gun owners are not fools and we are not fooled,&quot; That is right Wayne and XMO, Obama not going after our guns is actually a devious plot to go after our guns! Tue, Nov 15, 2011 : 1:49 p.m. I thought Obama was taking my guns? And I thought the Humane Society was going to outlaw ALL hunting in MI? What happened to those fears? Was it that they were in fact baseless? Mon, Nov 14, 2011 : 11:27 p.m.
Buy a man some venison and he will eat for a day. Teach a man to hunt and he will be gone for two weeks every November!